Editor’s Note: Consumer Reports’ 2014 Reliability Survey trashed Infiniti’sQ50 sedan, calling it one of the least reliable luxury cars on sale today. CR cited issues with the car’s navigation system, touchscreens, and Bluetooth connectivity as some of the more prevalent gripes from owners. Business Insider reviewed a 2014 Infiniti Q50 S Hybrid AWD earlier this year, and we loved actually loved it. We were impressed by its attention-grabbing looks, high-performance powertrain, and dazzling array of electronic gadgets — gadgets that become its Achilles’ heel in the CR survey. We didn’t experience any of the electronic gremlins that CR’s survey participants did. It isn’t easy being the most important car in the lineup of a luxury auto brand striving to keep up with the BMWs and Lexuses of the world. Nissan’s luxury brand has to anoint a successor to its popular and well-regarded Q40 model. But Infiniti also wants the Q50 to be the centrepiece of a reboot for the nameplate. The now-ageing G-series has performed admirably for a brand that has struggled to gain a solid footing in the hyper-competitive luxury-car market. In 2012, the G-Series accounted for a whopping 68% of Infiniti’s car (versus SUV and crossover) sales. Even in 2013, when the first Q50s hit the market, the G-Series accounted for 48% of Infiniti’s car sales. The first time you get behind the wheel of a Q50 your senses are inundated with bright LCDs, the smell of fine leather, and the growl of its engine. 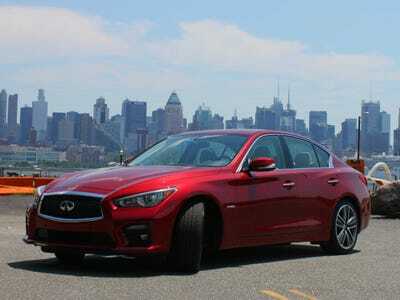 From its striking good looks to its gobs of high-tech goodies, the Q50 communicates in hyperbole. The Q50 Hybrid’s engine is no different. Propulsion comes from the marriage of the 3.5-liter VQ series V6 engine and a hybrid electric drive system. Together, they produce a hefty 360 horsepower and all the torque you’re ever going to need. And make no mistake, the hybrid system wasn’t developed exclusively so that the Q50 could be environmentally friendly; it also helps the car go faster. Speed comes with price. Although Infiniti claims the Q50 Hybrid delivers 27 mpg in the city and 31 on the highway, Business Insider recorded a combined fuel economy of just under 25 mpg. Our test car was crammed with more technology than the latest $US250,000 Bentley that I drove, not that tech probably makes all that much difference to most Bentley buyers. The lineup is dizzying: cameras on all four corners of the car, a system that keeps the car in the middle of the lane, another one that accelerates and brakes based on the car in front, and a gizmo that predicts whether the vehicle two cars in front of you will slam on the brakes. 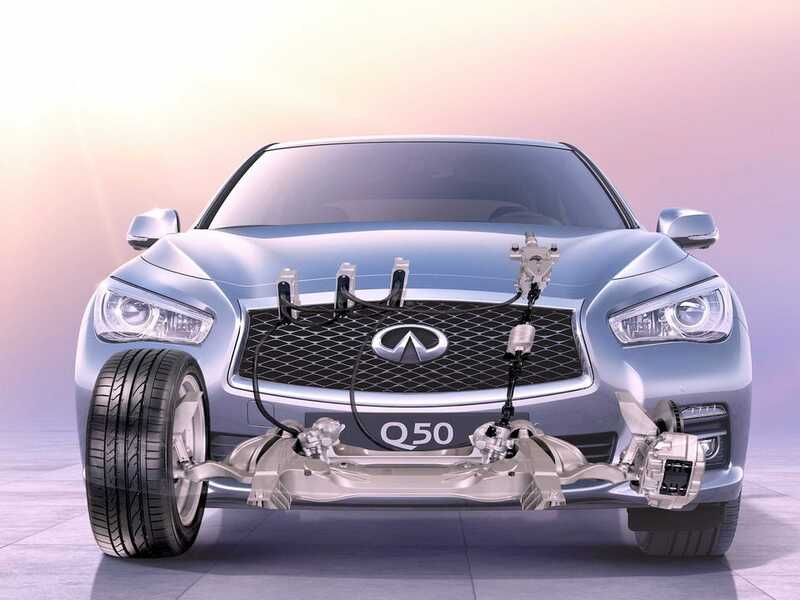 Our Q50 came equipped with Infiniti’s revolutionary direct adaptive steering (DAS) system. When the car is moving under engine power, there is no physical connection between the steering wheel and the front wheels. Instead, when you steer, your actions are piped through an onboard computer to the wheels. It’s like the control systems on most modern jets. Many automotive journalists, for whom a direct mechanical link between steering wheel and tire grip is a sacred covenant, have complained about the numb and detached feel of the “steer by wire” system. But it didn’t bother me. While it’s not perfect, the DAS provided adequate feel and effectively communicated the lay of the land. Sure, I couldn’t sense every crack, pebble, or asphalt nuance. But I didn’t really want to. InfinitiInfiniti’s direct adaptive steering system. With power routed through a 7-speed automatic transmission and Nissan Group’s legendary ATTESA all-wheel-drive system, the Q50 Hybrid rockets to 60 mph in a scant 5 seconds. The AWD Q50 grips hard; you’re not going to spin the wheels when you floor the throttle. There are instances, unfortunately, where Infiniti has to adjust how the gasoline powertrain interacts with the hybrid drive system. Under hard acceleration, there is a pronounced delay between the time the Q50’s electric motor requests help from the gasoline engine and the time the gas engine can turn on and provide power. This becomes dangerously evident on highway on-ramps, where acceleration on demand is essential. Like many of its competitors, the Q50 comes with a pair of paddle shifters mounted behind the steering wheel. Sadly, they don’t simulate manual control in the way they’re supposed to. While most shiftable automatic transmissions allow the driver a range of gears to choose from, the Q’s electronic brain seems to want the driver to shift only into the precise gear that the car demands, defeating the purpose of having a manual-shift option in the first place. As part of the sports package, Infiniti has given the Q50 S a stiff performance-tuned suspension that makes the sedan incredibly composed at high speed and in corners. However, by stiffening the Q50’s shocks and springs, its ability to soak up bumps and potholes has been greatly compromised. I could blame New Jersey’s poorly paved roads, but the ride is too rough to make the Q50 a good daily driver. The exterior of the Q50 features some of the most striking sheet metal in the marketplace (optional 19-inch wheels up the ante). More than a few passersby commented on our car’s eye-pleasing aesthetics. The Q50 is the most successful implementation of the aggressive front grill and headlight design found across the Infiniti lineup. Infiniti balances out the more aggressive elements by using sculptural lines to pull your eyes toward to the softer curves that dominate the rest of the car. While not as striking as the car’s exterior, the Q50’s interior is a strong selling point. It’s stylish, sensible, and remarkably pleasant. As you climb into the driver’s seat, the Q50 gives you an immediate sense of modernity blended with sportiness. The centrepiece of the interior is the Q50’s pair of touchscreen LCDs, a rarity even in ultrahigh-priced sedans. The dual-screen layout allows for an incredible level of flexibility, offering occupants the ability to tweak the car’s settings, access infotainment, and adjust climate controls without taxing the navigation interface. The Intel-powered lower screen can be laggy, but its tablet-style setup is clear and easy to use. On the downside, the Q50’s voice activation is incapable of understanding standard American English, and the navigation system looks like a dated rehash of the same system that Nissan has been using for the better half of a decade. Overall, the cabin is swathed in soft-touch leather panels and accented with real maple wood trim. Hefty control stalks are cut from the finest plastic. Seating is ample up front, but rear legroom is limited, especially for taller occupants. Trunk space for the Hybrid model is also limited, because that’s where the lithium-ion battery lives. I put the car through its paces on the streets of Weehawken, New Jersey, tracing the course that screaming Formula One cars would take should the proposed Grand Prix of America ever come to fruition. Like the F1 race that’s perpetually stuck in limbo, the Q50 has all of the elements required to be great. Sadly, the Q50 hasn’t quite revealed its full potential because of some small but irritating faults. Fortunately, annoyances like the throttle timing, paddle shifters, and navigation system can be easily fixed. How does it compare to its rivals? The Q50S Hybrid doesn’t offer the raw driving experience of the BMW 3-series, the brand cache of the Mercedes C-Class, or the refinement of the Lexus. However, it does a great job of aspiring to those qualities. What the Q50 does deliver is a powerful high-tech sports sedan that rocks a level of gizmofication usually seen only in ultrapremium sedans. 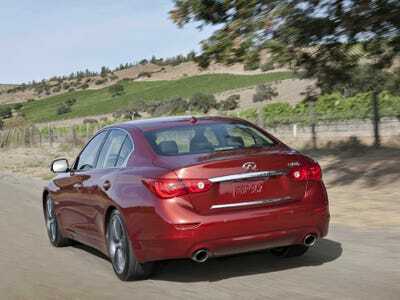 At a fully loaded price of $US55,000, the Infiniti Q50 S Hybrid is one heck of a good deal. Comparably equipped competing models cost thousands more. While its imperfections keep it from reaching greatness, the Q50 is still a terrific car, offering great bang for the buck. A worthy successor to the G-Series has arrived.